Ailing megachurch Pastor Eddie Long of New Birth Missionary Baptist Church in Lithonia, Georgia, whose mysterious illness has sparked speculation that he is suffering from HIV or AIDS, told his congregation in a recent sermon that he stopped answering their calls because they were asking too many questions. "I know a lot of you try to contact me, and call me and text me. I can't return all the texts, I get all the love. Just know I can't do it. It's just too many, too many," stressed an emaciated Long in a clip from a Dec. 11, 2016, sermon posted on YouTube. "But it makes me feel good to see all them folks that's praying for me. I want you to know because one reason I can't even when some ... is because everybody want to ask questions. I don't want to rehearse facts," Long said in a bid to silence his concerned flock. Long, whose career has been dogged by allegations stemming from lawsuits filed by multiple men who say he engaged them in sexual acts, sparked further chatter last summer when he revealed an unusually thin frame which he claimed was the result of a vegan diet. Weeks later, after rumors emerged that he had collapsed at his church and was gravely ill, Long released a statement saying he was suffering from a "health challenge" but has refused to say what it is, calling for privacy. "I am recovering from a health challenge that I trust God to deliver me from. It is unrelated to the eating for life diet consisting of mostly raw vegetables that I am continuing, as part of a holistic approach to good health," he said in a statement to The Christian Post last September. "At this time my family and I are requesting that you respect our privacy. I truly appreciate your prayers and support for me, my loved ones and my beloved New Birth Church family." Since then, Long has made limited appearances at his church and declared himself healed even while his body appears to be more frail and in need of assistance to move around his church. In his December message, he told his congregation that the only thing he wants to talk with them about is Jesus and his ability to heal and protect. He is not interested in answering their questions. "Now if you called me to talk about truth, and by his stripes, no weapon formed, I will not die but live, you are the head, not the tail, you want to talk about that, we can have a nice conversation," he said, quoting familiar Scriptures. He then told them about his plans to get stronger, but stressed that he would be scaling back his preaching commitments indefinitely. "As I get stronger, you'll see me more. I plan to be fully engaged ... we're gonna switch back to one service for a while and we're going to celebrate and do all that we can," he said. He further told his congregation that if they want to do something for him just "show up and bring somebody with you." 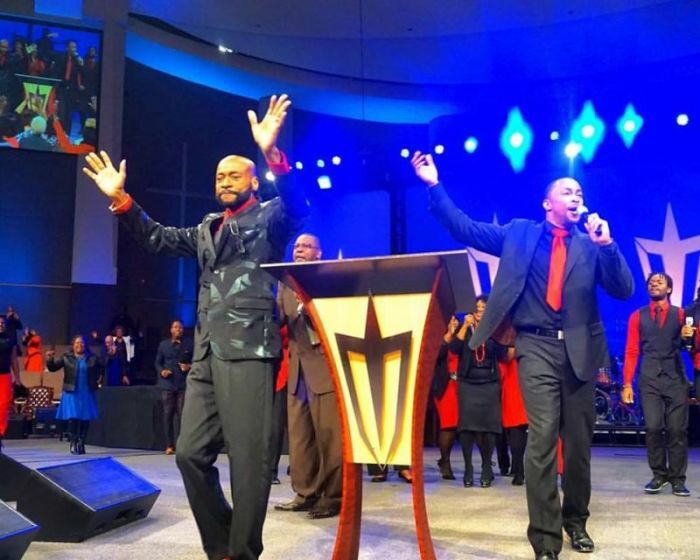 Long's secrecy about his illness recently drew the ire of iconic gospel singer and pastor of Love & Liberty Fellowship Pentecostal Church in Houston, Texas, Kim Burrell who called his condition heartbreaking in a recent video clip. "I've never seen anything as heartbreaking as watching Bishop Eddie Long go down to nothing. It is an embarrassment to the Church. 'Cause nobody would be making that you have AIDS unless a homosexual man didn't come out and reveal what you did behind closed doors ... they have yet to deny it," she said. Long settled with his accusers — Anthony Flagg, Maurice Robinson, Jamal Parris and Spencer LeGrande — in May 2011, approximately eight months after they leveled charges that he had coerced them into having sexual relationships with him while they were teenage members of his congregation.